Kampala socialite, Suleiman Kabangala Mbuga is to regain his freedom soon according to his family. Speaking to PML Daily on phone, Mbuga’s brother Abraham Mbuga, revealed that in Dubai, a suspect is supposed to be on remand for nine months. However, if such a person stays on remand for 45 days without anyone coming forward with evidence against them then that person is set free. Abraham also revealed that he was himself once imprisoned at the same facility but got off free. “I was once charged in the same country and same court on file number 17208/2017 inDubai courts but I won asimilar case recently and I am to be compensated for damages.” Mr Mbuga revealed. 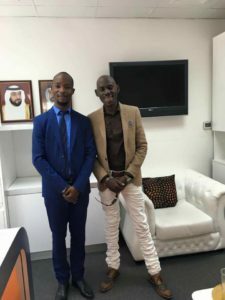 SK Mbuga was arrested in Dubai last month on allegations of fraud. He was last week transferred from Dubai airport to Awir Central Jail, also in Dubai. This was after he completed 14 days on remand as investigations into his case went on. Together with his wife, Angella Vivienne Chebet, 33, the couple is accused of fraudulent transfer of money amounting to 53m Kronor (about Shs23 billion) from a company account that Chebet was running with her 71-year old Swedish boyfriend, Sten Heinsoo.